1. Preheat the oven to 200°C, gas mark 6. Toss the sweet potato with the oil, season and spread out on a large baking sheet. Roast for 20 minutes, stirring halfway, until tender. Meanwhile, combine the tomatoes, onion, avocado, cumin, black beans, lime juice and coriander; season. Fold in the roasted sweet potato. 2. 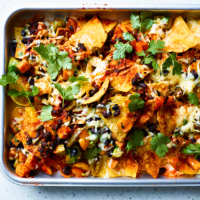 On a large plate or an ovenproof dish (if serving hot), layer the tortilla chips up with the sweet potato mixture, jalapenos, spoonfuls of soured cream and dustings of paprika. Add crumbled feta between the layers if serving at room temperature, or if you want to eat it hot, use grated cheddar and bake in the oven at 220°C, gas mark 7, for 15-20 minutes. Scatter with some extra coriander leaves and serve.